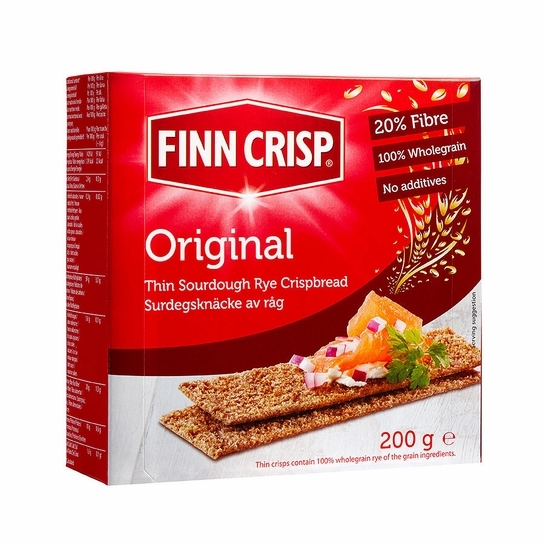 More about Finn Crisp Original Sourdough Rye Thins Crispy snacks have an all-natural, whole grain, low-calorie and flavorful answer in the Finn Crisp Original Rye Crispbread. Super-thin rectangles are baked with care to crispy perfection, free of artificial ingredients and GMOs. Spread butter, cheese, or hummus and top with any open-faced sandwich topping you can imagine, such as cured salmon, avacado, cucumber or tomato. Serve as appetizers with artful herb garnishes, or as a side for soups and salads. The lightweight crunch and dark rye flavor are a satisfying and healthy Finnish treat. Ingredients: Whole grain rye, flour, water, salt, yeast. Made in a facility that also uses wheat. Itâ€™s great to be a able to just jump on your site and return to my wifeâ€™s native country, by buying products that remind her of home!! After living in Finland for several months, I missed the delicious rye crackers that were a staple in our house. I was thrilled to find these! Thin, crunchy, and delicious! They discontinued it after Amazon took over. These really hold up â€” I was worried theyâ€™d be fragile because they are so thin but they hold up! Not a single one was broken in the box when it arrived and you will get a lot of these in a box. I am gluten-intolerant and these work for me, Love the taste also. I love rye bread but not the calories. This is the perfect solution. Curbing the hunger snack monster and low in calories. Will have to purchase more since I keep sharing with friends. I lived in Finland for a year and deeply miss Finnish products. I finally found some through Finn Style! These are exactly what you would buy in a Finnish super market and they taste great, very crisp, hearty, and perfect for spreads. I highly suggest these! Great tasting. Reminds me of my childhood and the foods I enjoyed at my Finnish elders home. Prompt delivery. A wonderful cracker that goes with everything! A great alternative to wheat for hose that can't eat wheat. At only 20 calories a slice, these are a great low-carb, high fiber alternative to wheat crackers and corn chips. They are thin and crispy with a satisfying crunch. Where can I get the original rye crisp?